Business blogging is even harder. People with personal blogs want to succeed just as much as business bloggers. Someone with a personal blog (mine include Country Music Life and HunterShare) wants to attract tons of readers and maybe even make a little money with advertising or selling their own products. Mostly, though, a personal blogger is looking to connect with others that have the same interests. Business blogging is a little more difficult because there is pressure to perform. Sure, a personal blogger wants to succeed, but if they don’t they can shrug it off because blogging is just a hobby. Business bloggers can’t shrug off bad performance. The pressure is on to succeed and that revelation is what had me thinking recently. In order to have a successful business blog a business needs to have a blogging strategy that includes three important circles. 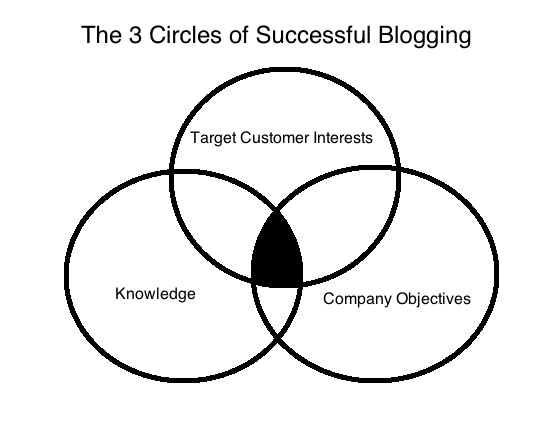 With just two of these circles intersection the blog might achieve a little success, but for a business blog to succeed all three circles will need to intersect. I’m going to admit that this image is pretty crude. I don’t have any design skills. I just wanted to get some kind of visual in front of you because I think it’s important. Target Customer Interests – Every business has a target customer. That customer has interests that they search for online and look for in conversations with their friends including conversations on social networks. Content drives these interests. Videos, blog posts, articles, songs and podcasts are what this customer finds when they are looking for information about their interest. Knowledge – Everybody has knowledge about something. As long as humans have been on this planet there have been people that have been teaching knowledge to others. Knowledge has been passed on. As humans we seem to be programmed to continue to learn until the day we die. We have a thirst for knowledge and we seek out those that can provide it in ways we understand. Company Objectives – Your company has objectives. You need to meet certain profit and sales requirements. You don’t take on any marketing efforts without focusing on the company objectives because if you don’t your just throwing money away and that is not good business. What happens many times in the blogging world is that people will find that they’re blogging with only two of the circles intersecting. For example, a personal blog often focuses on the intersection of knowledge and target customer interests. If someone wants to create a personal blog about race cars they can do it with no issue. There are not likely any business objectives tied to the blog because there is no company. The blogger is simply working on the blog because they love it and they love the connection they get with people. Businesses can create blogs that work in the same intersection as the personal blog, but businesses can also work in the intersection of knowledge and company objectives. As a business you have people that have great knowledge about certain topics. You have deep understanding of your industry and you tie that knowledge with the goal of promoting products and services and that content becomes your company blog. But you can’t have a truly successful blog without writing about what your customers care about. For a blog to truly be a business blog it needs to include all three circles. An example would be a company that discusses customer questions with the customer service and sales department. The blogging team will seek to understand what the target customer is interested in learning. From there the blogging team will work to build the knowledge or simply bring out the knowledge within the company to create blog posts that fulfill the interest needs of the customers. Finally, the company objectives are brought into play. For business blogging the objective is often done at two levels. First, the blog will generate new interest in the brand. This is done through search and social sharing (referrals). The target customer are searching for information and they find the blog posts and discover the brand. Second, the blog works as marketing content to teach the prospect about the industry and the company with the goal of building trust in the brand until the prospect is ready to go through the sales cycle. It’s easy to fall into a blogging strategy where two of the circles intersect. If you can get your blogging strategy to intersect at all three circles you’ll have something powerful that will be part of your growing business.